Creature (Dis)Comforts was the first thematic workshop held as part of ArtCan's Ideas Stream. Participants gathered at The Banff Centre in May 2014 to explore the representation of animals in Canadian Art. The Creature (Dis)Comforts workshop brought together artists, art historians, and curators to think critically and deeply about nonhuman animals in Canadian Art. The workshop was intended to be the beginning stages of a dialogue, to get the ball rolling in the hopes of generating more discussion, creative works, and scholarship on the subject. In spite of the plethora of nonhuman animals who make an appearance in Canadian art, there is little critical discussion about what it means to represent other species in these ways. One of the fundamental assertions that this workshop was built upon was that representations of other species have the potential to both reinforce and challenge dominant ideas about our relationships with nonhuman animals. At the same time, however, we recognize the important historic, symbolic, and cultural significance that representations of nonhuman animals have held for human cultures. Our goal was not to replace existing histories and narratives but, rather, to recognize another layer of complexity that exists with visual representation of nonhuman species. The Banff Centre was a great space for these conversations to take place as this location offered very tangible reminders of how entangled our lives are with those of nonhuman animals. As we walked from our residence rooms to the meeting spaces, chipmunks scurried in front of us on the paths, and birds flew overhead. We kept our eyes out for deer, especially during dawn and dusk when they would gather on the lawn of the Banff Centre campus to graze. We were all very aware of the potential to encounter bears while visiting this celebrated National Park. As we got to know one another, we exchanged stories about hair-raising adventures involving “wildlife,” and when we walked in to town we travelled on foot along Buffalo, Muskrat, and Beaver Streets. One afternoon we left the Banff Centre and gathered for our sessions in the historic Banff Park Museum, a space that pays homage to ways of representation, displaying, and classifying nonhuman animals that were dominant in previous historical eras. Simply put, in Banff it was hard to ignore the multitude of ways in which human and nonhuman lives are entangled. One of the main themes that emerged within the workshop was the number ways in which representations of nonhuman animals shape our encounters with and ideas about the flesh-and-blood, living, breathing animals who serve as a referent for so much Canadian art. While human and nonhuman histories are very obviously entangled in a space like Banff, these kinds of interspecies relationships are often not foregrounded in other aspects of our lives, including dominant discourses within the academic discipline of art history. The theme of Creature (Dis)Comforts was chosen for this workshop because quite often when we start thinking critically about nonhuman animals we bump up against very complex issues that can push us out of our comfort zone as artists, scholars, activists, thinkers, and citizens in a multispecies world. The way we relate to and think about other species is, of course, incredibly complex. In our current times, as we face unprecedented environmental changes, it is imperative that we step outside of our “comfort zones,” to think differently about our place in this world alongside other species. This topic, therefore, is a timely one. While discussion about nonhuman animals may, at first glance, seem out of place in a project concerned first and foremost with human cultural and creative endeavours, we recognized the absolute interconnectedness of these two realms. Humans have long been fascinated with nonhuman animals, and there is a long history of representing other species through art. Further, the bodies of nonhuman animals have been used in art making for centuries. Fur, hide, and feathers are the most obvious examples here, but there are also more hidden ways in which animal bodies are physically rendered in to art – hooves and bones of cattle are ingredients in gelatin (an primary ingredient in film), cochineal beetles were the source original source of carmine, and marine snails have been used to make Tyrian purple for centuries. In other words, nonhuman animals lives (and deaths) are inextricably linked with the history of art in a number of ways. And yet, until relatively recently, little critical attention has been paid to this aspect of art history, it has been taken as a given.1 The Creature (Dis)Comforts workshop, then, aimed to begin these conversations in a Canadian context. We see critical thinking about nonhuman animals in Canadian art and art history as part of broader discourses about power, place, and identity that are already underway. In other words, we have no desire to supplant currently existing conversations but, rather, to add another layer of complexity to them. Dr. Julia Skelly's presentation at Creature (Dis)Comforts focused on Brad Woodfin’s paintings of animals, and through this case study asked participants to think about the timeliness of bringing nonhuman animals in to focus in Canadian art in the 21st century. Skelly also reinforced the notion that this must work alongside other existing theoretical frameworks, an idea she elaborates on in the following video. One of the most dynamic aspects of the Creature (Dis)Comforts workshop was that it brought together artists, art historians, and curators, each bringing an important and unique perspective to the discussions. For example, Dr. Anne Koval was at the beginning of a curatorial residency at The Banff Centre as the Creature (Dis)Comforts workshop began. The specific project that Koval was in Banff to complete had to do with the representation of nonhuman animals in museums, and, as such, brought this aspect in to sharp focus during the weekend. 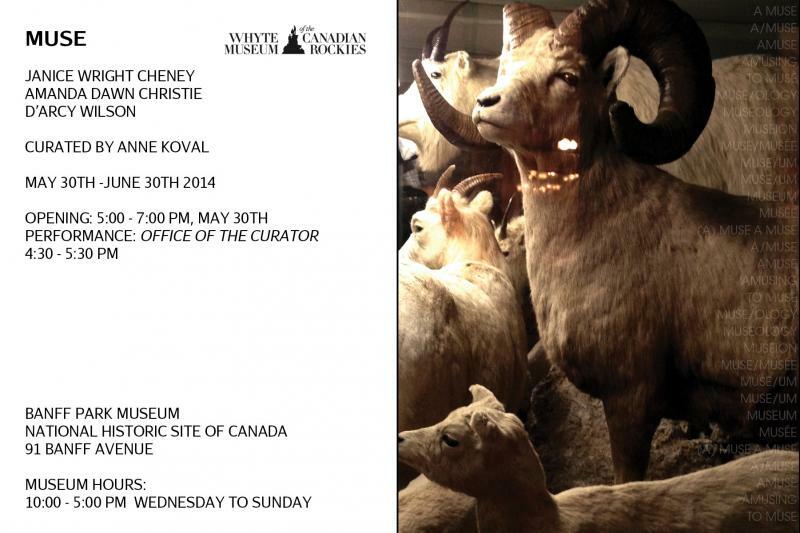 The end result of Koval’s residency was an exhibition entitled Muse which opened at the Banff Park Museum on the 30th of May, 2014. This exhibit was Koval’s response to the historic, taxidermic natural history displays contained within this space. In addition to bringing a critical eye to a very specific form of representing animal bodies, Koval’s curatorial engagement with this space raised important questions about museum practices, classifying, and collecting. Muse featured the work of D’Arcy Wilson and Amanda Dawn Christie. It also featured work by New Brunswick artist Janice Wright Cheney, including a site-specific piece that was completed in Banff for the exhibition. Wright Cheney also participated in the Creature (Dis)Comforts workshop, and her work was particularly well-suited to the themes as she explores the tensions that exist between “nature” and “culture” in terms of representing and relating to nonhuman animals. 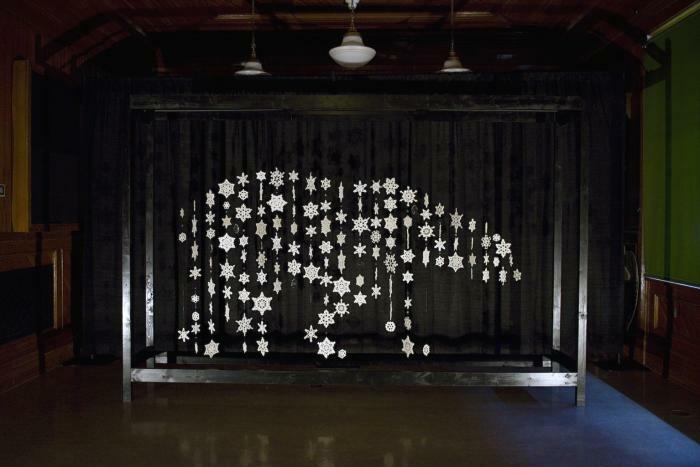 Wright Cheney created Spectre while in residency at Banff, a piece inspired by Buddy, a polar bear who was kept at the Banff zoo in the early 20th century. Buddy was, at least for a little while, one of the star attractions of the Park, but there were concerns about the size of his cage and the conditions in which he lived. What, one might wonder, was a polar bear doing in the Canadian Rockies? Buddy was “out of place” and, to Wright Cheney, it seemed as though he was held in a “condemned state,” within his small enclosure so far removed from his natural habitat. 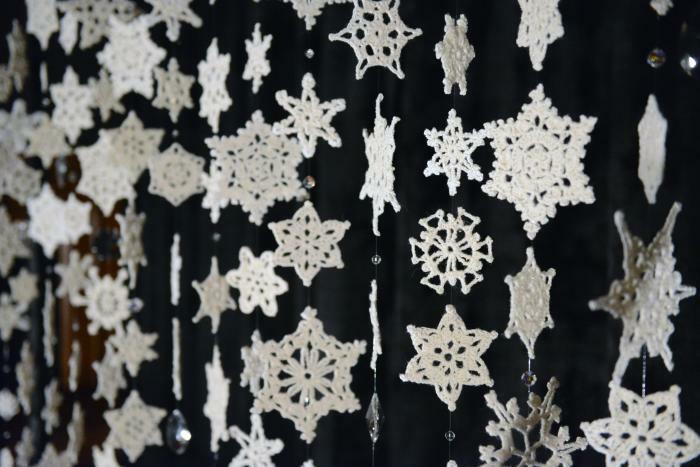 Her piece Spectre is made out of crochet snowflakes which formed a ghostly representation of Buddy in the Banff Park Museum, a piece that at once honours his memory but also asks viewers to critically reflect on what happens when borders are transgressed in terms of our encounters with nonhuman species. Donna Szoke and Maria Whiteman were two other artists who participated in the Creature (Dis)Comforts workshop, both also focusing on historical relationships between human and nonhuman animals in their recent work. Szoke, a new media artist based in St. Catharines, Ontario, spoke about her work in the context of in/visible animals. Szoke talked about how that which is “unseen yet apparent” is a driving force in her art practice, and she is interested in exploring how “invisible animals” insert new discourses in to contemporary art. Szoke recently completed two site specific media pieces that deal directly with the historical lives of nonhuman animals from this perspective. Alfred Waits (2012) focuses on a horse who died in battle in the early 19th century, and Invisible Histories (2012–) was inspired when Szoke learned about a burial site near Niagara Falls that contains the bodies of 280,000 radioactive mice. The session at Creature (Dis)Comforts led by Whiteman looked at the idea of loss in terms of the representation of nonhuman animals in contemporary art, and she discussed her 2011 piece, Day Dreamer, in this context. This is a video/performance piece in which the artist gently strokes taxidermied animal bodies that are otherwise hidden from view in museum storerooms. This gentle action evokes a sense of unease as the viewer comes to the realization that the animal Whiteman strokes has long been dead. Whiteman sees our relationships with nonhuman animals today as always “tinged with questions of loss and responsibility,” and this piece certainly raises uncomfortable questions about dominant ways of engaging with animals, both today and in past historical eras. Daina Warren, Gallery Director at Urban Shaman, and Jessica Jacobson-Konefall, a PhD Candidate in Cultural Studies at Queen’s University, led a session at Creature (Dis)Comforts that explored different curatorial strategies for thinking about animals in Contemporary art. Warren focused on an exhibition she curated for VANOC in 2010 called “Contains Animal Byproducts!,” an online show featuring the work of such celebrated Canadian artists as Aganetha Dyck, Bill Burns, and Mary Anne Barkhouse. Jacobson-Konefall centered her presentation on three exhibitions that were held at Urban Shaman, which featured work by Jude Norris, Nadia Myre, and Jordan Bennett. Jacobson-Konefall focused on these exhibits as a way to raise important questions about the relationships that exist between animality and violence in a settler-colonial framework, and she elaborates on these ideas in the following video. Warren and Jacobson-Konefall also discussed challenges and opportunities that arise when working within an online framework for curatorial and art historical projects, and their work together on this front is explored below in a SSHRC Storyteller video. My presentation at the workshop posed the following question – “What would Canadian art history look like if we took the question of the animal seriously?” I wanted to challenge participants to think differently about the standard narratives of Canadian art history – not to replace or supplant the stories we already tell about our collective cultural history, but to add to them, to bring in serious consideration of the nonhuman animals represented within. Creature (Dis)Comforts was designed to initiate conversation about these topics and ideas, to raise questions, and to begin what I hope will be an ongoing and rich dialogue. 1 Some notable recent exceptions include Steve Baker, Artist/Animal (Minneapolis: University of Minnesota Press, 2013); Ron Broglio, Surface Encounters: Thinking with Animals and Art (Minneapolis: University of Minnesota Press, 2011); Diana Donald, Picturing Animals in Britain, 1750-1850 (New Haven: Yale University Press, 2007); Stephen F. Eisenman, The Cry of Nature: Art and the Making of Animal Rights (London: Reaktion Books, 2013).